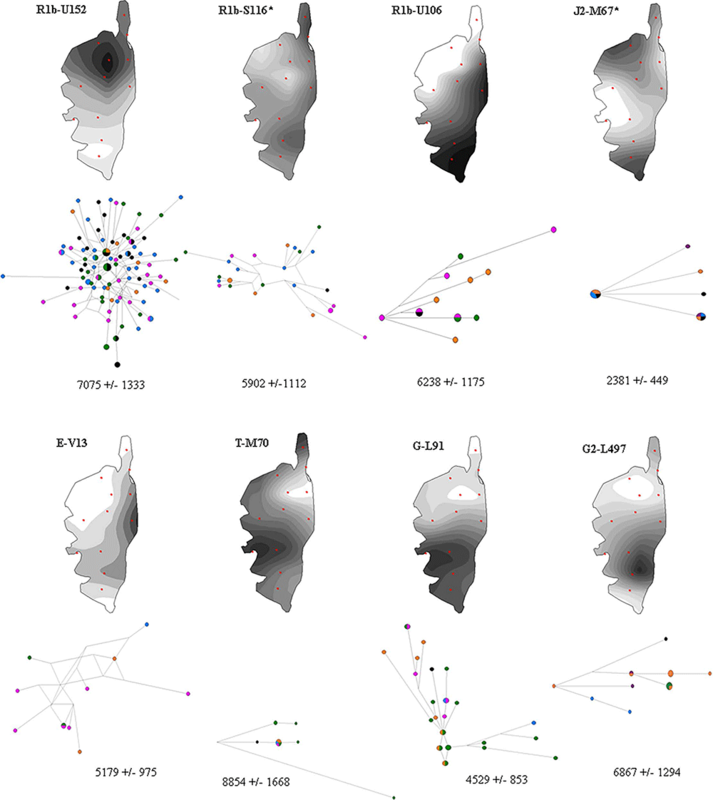 Brief communication (behind paywall) Yleaf: software for human Y-chromosomal haplogroup inference from next generation sequencing data, by Arwin Ralf, Diego Montiel González, Kaiyin Zhong, and Manfred Kayser, Mol Biol Evol (2018), msy032. Next generation sequencing (NGS) technologies offer immense possibilities given the large genomic data they simultaneously deliver. The human Y chromosome serves as good example how NGS benefits various applications in evolution, anthropology, genealogy and forensics. Prior to NGS, the Y-chromosome phylogenetic tree consisted of a few hundred branches, based on NGS data it now contains many thousands. The complexity of both, Y tree and NGS data provide challenges for haplogroup assignment. For effective analysis and interpretation of Y-chromosome NGS data, we present Yleaf, a publically available, automated, user-friendly software for high-resolution Y-chromosome haplogroup inference independently of library and sequencing methods. 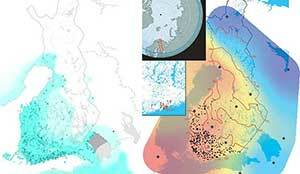 Here is a link to the software Yleaf’s website, from the Department of Genetic Identification, at the University of Erasmus Medical Center. In the time of NGS (or massively parallel sequencing, MPS), the amount of genomic data produced and made publically available is rapidly expanding, providing valuable resources for many areas of research and applications. Due to its haploid nature and male-specific inheritance, the non-recombining part of the human Y-chromosome (NRY) is highly suitable for phylogenetic studies and for addressing questions in evolution, anthropology, population history, genealogy and forensics (Jobling & Tyler-Smith, 2017). Over recent years, NGS data allowed the phylogenetic NRY tree to dramatically increase in size and complexity (Hallast et al. 2014; Poznik et al. 2016). The two most comprehensive tree versions ISOGG (http://www.isogg.org/tree) and Yfull (https://www.yfull.com/tree) currently contain thousands of branches. 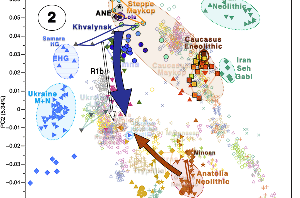 However, the complexity of both, Y tree and NGS data provide immense challenges for NRY haplogroup assignment, which reflects a key element in many NRY applications. Here we introduce Yleaf, a Phyton-based, easy-to-use, publically-available software tool for effective NRY single nucleotide polymorphism (SNP) calling and subsequent NRY haplogroup inference from NGS data. By comparative whole genome data analysis, we demonstrate high concordance of Yleaf in NRY-SNP calling compared to well-established tools such as SAMtools/BCFtools (Li et al. 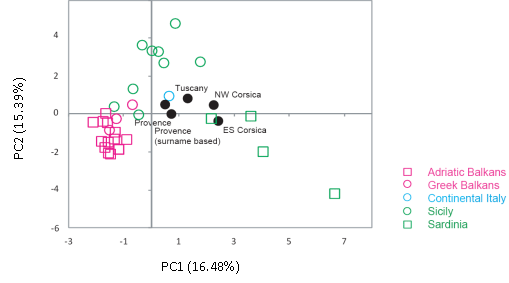 2009), and GATK (McKenna, et al. 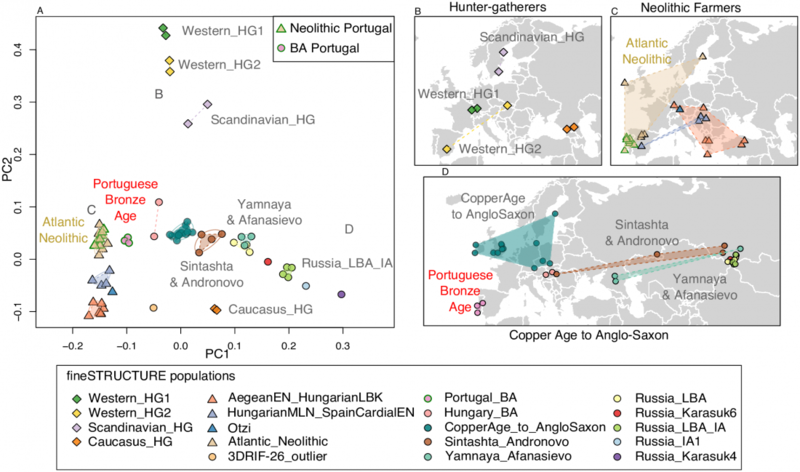 2010) as well as improved performance of Yleaf in NRY haplogroup assignment relative to previously developed tools such as clean_tree (Ralf et al. 2015), AMY-tree (Van Geystelen et al. 2015), and yHaplo (Poznik, 2016). Yleaf allows analyzing NRY sequence data from many types of NGS libraries i.e., whole genomes, whole exomes, large genomic regions, and large numbers of targeted amplicons. Several modifications relative to our previously developed clean_tree tool (Ralf et al. 2015) were implemented to optimize the performance especially relevant for extremely large NGS datasets such as whole genomes. For instance, Yleaf extracts the Y-chromosomal reads prior to further processing and uses multi-threading, a batch option is included too. Importantly, Yleaf provides drastically increased haplogroup resolution i.e., from Downloaded from 530 positions defining 432 NRY haplogroups with clean_tree (Ralf et al. 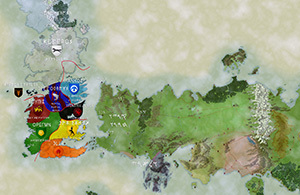 2015) to over 41,000 positions defining 5353 haplogroups with Yleaf. For a detailed method description see the supplementary material. Featured image: From Martiniano et al. (2017). Several thousand years ago, likely Tanzanian herders migrated far and wide, reaching Southern Africa centuries before the first farmers. 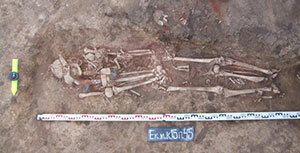 West Africans were likely early contributors to the gene pool of sub-Saharan Africans. Modern farmers, the ones as old as 500 years old, did have Bantu DNA in their genomes, but the ancient hunter-gatherers predated the spread of the Bantu. 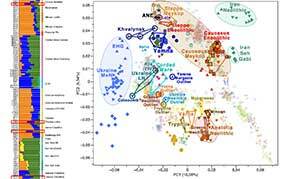 Razib Khan, asked about the Afroasiatic homeland by David Reich, has taken this opportunity to publish his own hypothesis on the expansion of Afroasiatic, given the known Admixture analyses, using Y-DNA phylogeography, and with reasonable assumptions. 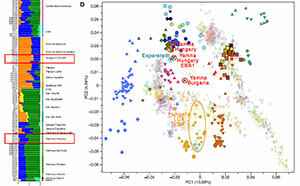 He concludes that Afroasiatic expansion might also be associated with the western expansion of E1b1b subclades from a Levantine (“Natufian”) homeland. I think it is necessary to remind everyone of the many problems unsolved by Indo-European studies – a much older discipline (and with more research published) than Afroasiatic studies. It is already quite revealing that we can’t still trace back Proto-Semitic to its homeland, and that Proto-Semitic is probably as old as Late Proto-Indo-European. We are talking, then, about an ancient proto-language – Afroasiatic – possibly older than Middle Indo-European (or Indo-Hittite), and whose dialects are still not well studied – but for the Semitic and Egyptian branches. 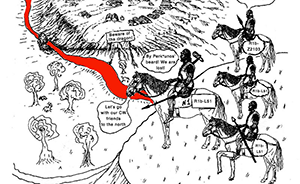 Linguistic guesstimates or phylogenetic speculation date the proto-language (and thus the homeland) within a wide range, from 15,000 to 6,000 years ago. There is an obvious trend (probably driven by Semitic and Egyptian researchers) to place the Afroasiatic Homeland near one of the many proposed Semitic homelands, i.e. in East Africa. 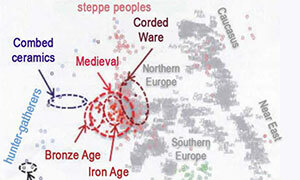 This is similar to the trend seen in the first half of the 20th century in Indo-European studies, with most proposals locating the Proto-Indo-European homeland in Europe. European languages were the best known, and only the perceived antiquity of Vedic Sanskrit made some propose South Asian origins for the proto-language. 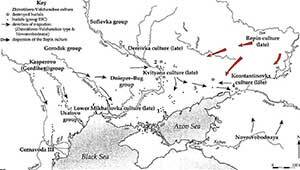 However, it was only careful interpretation of linguistic finds, combined with archaeological data, what eventually yielded the Kurgan hypothesis, which has been since refined. Razib Khan’s proposal makes sense in that it fits what others have proposed before, i.e. 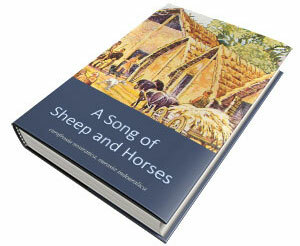 an east African or Middle Eastern Afroasiatic homeland, and that it links it with the expansion of farming. However, we have to keep in mind that until 5,000 years ago the Sahara was not the desert we know: it had certain important green corridors, humid areas between megalakes. The Sahara might not have been exactly green 10,000 to 5,000 years ago (roughly the time when Afroasiatic must have been spoken), but it had certain regions that allowed for an east-west migration. However, it also allowed for a west-east migration, and – perhaps more importantly – for a sizeable population expansion in central Saharan territory. To forget that is to allow for potentially wrong assumptions to be made. What we expect from the next papers on ancient African DNA samples are the result of certain (more recent) population – and thus potentially ethnolinguistic – movements, but they probably won’t solve the question of the Afroasiatic homeland, which has an older time span than the samples studied. There is a wide void in African prehistory – compared with Near Eastern history – and this research will be closing that gap, just like European samples are helping close the gap in the prehistory of western, northern, and eastern Europe, compared to the history of the eastern Mediterranean regions. 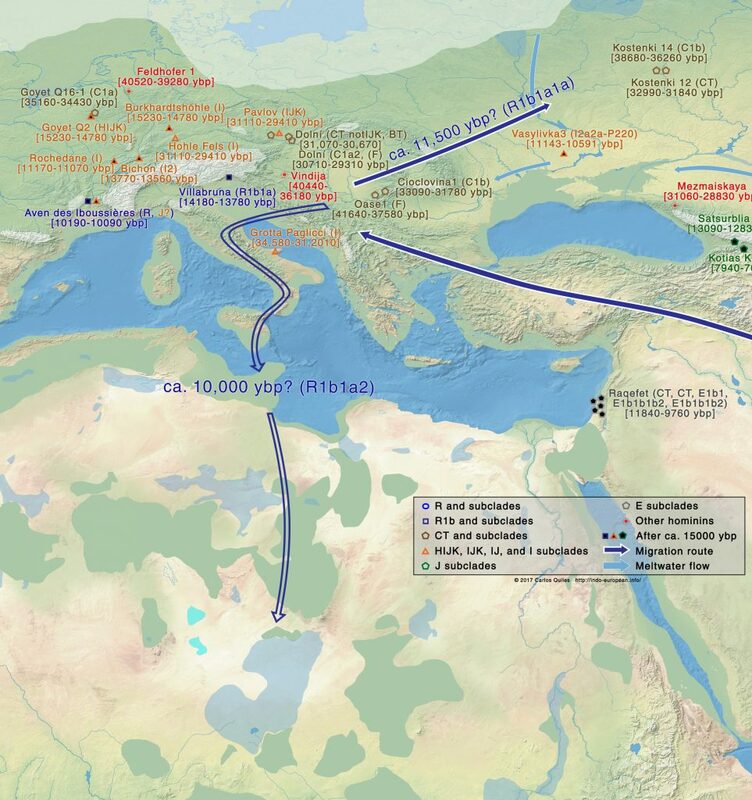 I already wrote, regarding the potential ethnolinguistic link between Indo-European and Afroasiatic, that a close look at the migration of R1b-V88 lineages from Europe (through southern Italy?) into the Sahara – through the Fezzan-Chad-Chotts, and Chad-Chotts-Ahnet-Moyer megalake green corridors – could have been the key to the successful expansion of Afrasians. 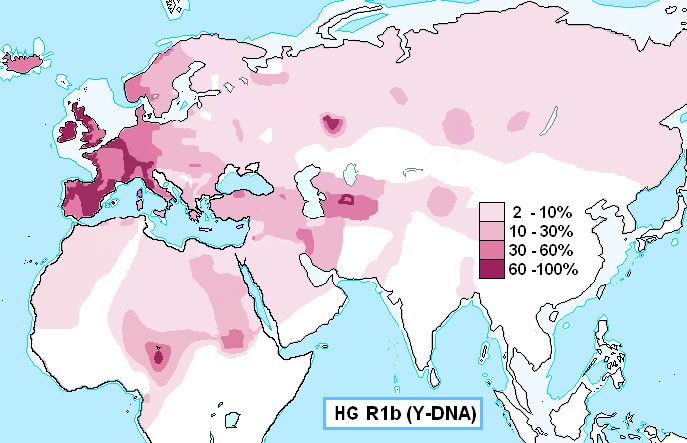 Interesting aspects to take into account are the distribution of R1b-V88 lineages, compared to the location of Chadic languages (probably the most divergent and least known of the group) and to the potential North Afroasiatic (composed by Egyptian, Berber, and Semitic) and South Afroasiatic group (made of Cushitic and Omotic). 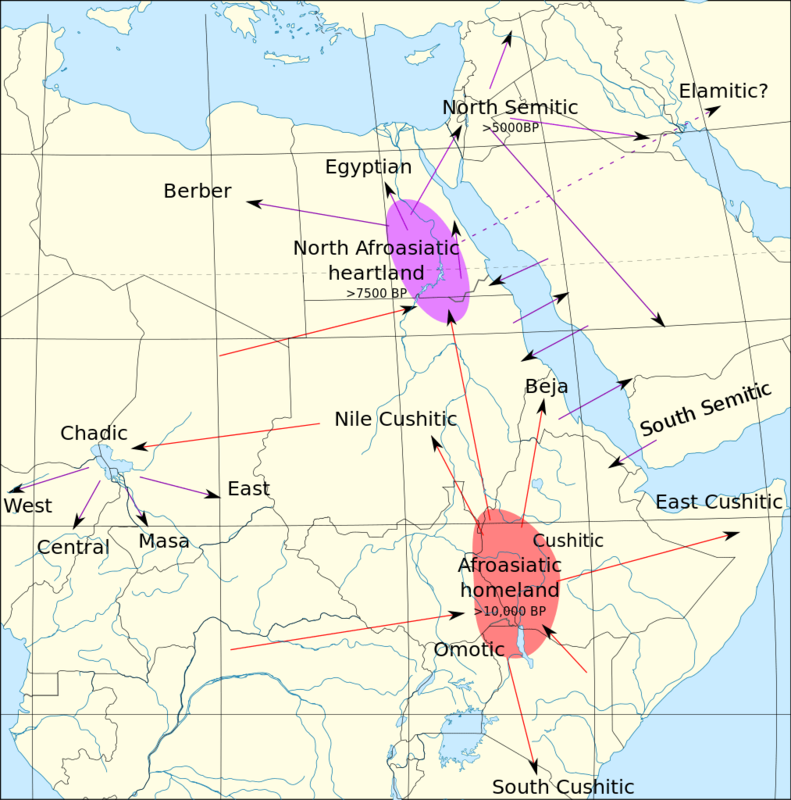 Chadic has been argued to be connected variously to North Afroasiatic, or to the Berber branch, but the Northern group has also been argued to be connected with Cushitic, with Omotic as an independent branch. Also interesting would then be the potential connection between Indo-European (or Indo-Uralic) and Afroasiatic. We could speculatively place the potential primary Afroasiatic homeland in the south-central Sahara, near the Megachad lake (i.e. near the peak of R1b-V88 lineages), with a secondary homeland in eastern Africa (as in the map above) – and maybe a tertiary homeland (of North Afroasiatic) in the Middle East, associated with the expansion of “Natufians” and E1b1b subclades. 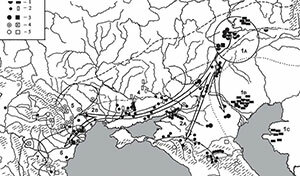 The identification of the spread of Afroasiatic languages with the expansion of R1b-V88 lineages needs an anthropological context (linguistic and archaeological) that is obviously lacking today. It is important to keep all possibilities in sight when reviewing genetic analyses. A homeland but not the homeland, by Davidsky at Eurogenes, posing a question to which Razib Khan seems to respond in his post. EDIT (16/7/2017): Added link to Neby’s post on a potential Semitic homeland, and Nature article on Schlebusch and Skoglund research.